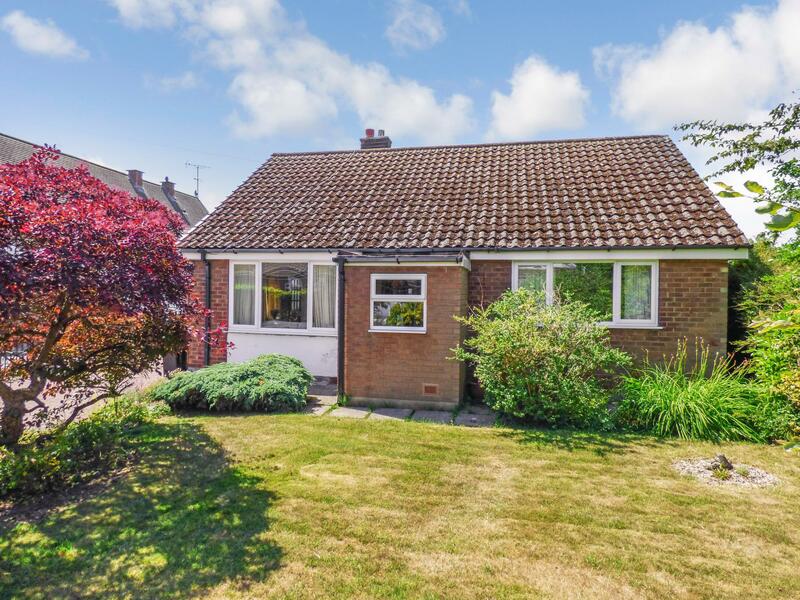 We are pleased to offer for sale this 2 bedroom detached bungalow situated in a popular and sought after residential area in High Lane, close to the village center providing the convenience of public transport, local shops and restaurants. Briefly the accommodation comprises of: enclosed entrance porch, lounge with fireplace, separate dining room, kitchen, rear porch, two good sized bedrooms, inner hallway and bathroom. Outside there are gardens laid to front and rear with blocked paved driveway for parking for 3 cars. There is also a detached brick built garage with workshop to rear. Composite entrance door to porch, Georgian style timber door through to lounge area. uPVC double glazed windows to front and to side aspects, gas fire with timber surround, double radiator, T.V. point, power points, coving to ceiling, door to dining room, sliding door to inner hallway. uPVC double glazed window to rear porch, range of fitted wall and base units with worktops, inset sink with mixer tap. Half tiled walls, Glow-worm gas central heating boiler, space for cooker and fridge, timber glazed door leading to rear porch. uPVC double glazed windows, with half brick base and uPVC roof and door leading to garden area. Plumbing for washing machine and space for tumble dryer, power points. uPVC double glazed window to front aspect, single radiator, power points, access to loft void. uPVC double glazed window to rear and side aspects, double radiator, power points. uPVC double glazed opaque window to rear, glazed shower screen with Mira shower, vanity sink unit, low level w.c, fully tiled walls, chrome heated towel rail. Detached brick built garage with up and over door, side door, single glazed window to side aspect. Power and lighting. with single glazed window to rear, power and lighting. The front garden is mainly laid to lawn with a variety of mature trees and shrubs. Block paved driveway providing off road parking for 3 cars. Timber secure gate leading to rear garden. The rear garden is also mainly laid to lawn with a flagged patio area and mature planting and is enclosed by fencing. Viewings are strictly by appointment with Ian Tonge Property Services, 150 Buxton Road, High lane, Stockport, SK6 8EA. Telephone 01661 762677. Brookside Lane can be found of the A6 in the centre of High Lane village and can be found on the right hand side clearly identified by our For Sale board.